With Star Wars: The Rise of Skywalker serving up as the opening act to Star Wars Celebration in Chicago, another highly anticipated project got its time to shine on Sunday. 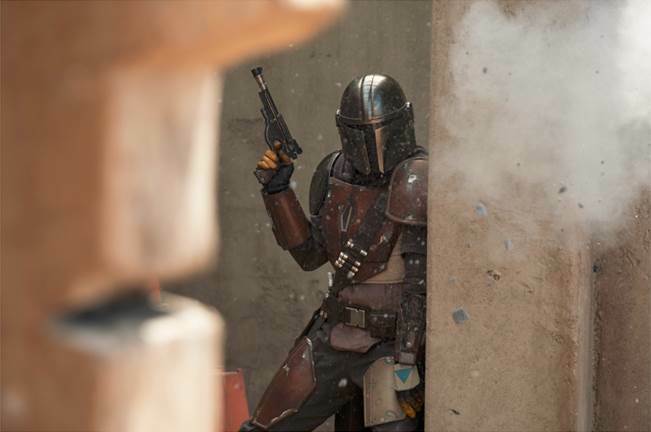 This project will be the first ever live-action Star Wars TV series titled The Mandalorian, which is set to premiere on Disney's new streaming service Disney+ later this fall. The show comes from Iron Man director Jon Favreau, who has his own ties to the Star Wars franchise voicing the Mandalorian character Pre Vizsla on the animated The Clone Wars series. He will serve as showrunner, with his series taking inspiration from classic westerns like Clint Eastwood's The Dollars Trilogy and Akira Kurosawa samurai films like Yojimbo. On Sunday's panel, Favreau was joined by Lucasfilm head Kathleen Kennedy as well as friend and fellow Star Wars showrunner Dave Filoni. It was confirmed that the series is set five years after the events of Return of the Jedi, and focuses on the adventures of the long guns fighter known only as the Mandalorian in the far reaches of the Outer Rim. The series will feature episodes directed by talents such as Taika Waititi, Rick Famuyiwa, Dave Filoni, Deborah Chow and Bryce Dallas Howard. The cast is headed up by Pedro Pascal as the titular Mandalorian, and is joined by Gina Carano, Carl Weathers, Giancarlo Esposito, and Werner Herzog. Carano plays an ex-Rebel shock trooper named Kara Dune while Weathers plays Grief Marda, the local bounty hunter guild head. Opposing them are Esposito and Herzog as remnants of the Galactic Empire. Pascal, Carano and Weathers later joined Favreau and Filoni on stage for the panel with each speaking a bit on their roles for the series and how they relate to each other. Favreau also spoke about the series' direction and how he approached it with the same mentality as Iron Man with Marvel. He wanted to create a series that was welcoming to new fans, while also constructing it with the kind of attention to detail that longtime fans will enjoy and feel rewarded for watching. With the series' setting, Favreau saw an opportunity to bring together elements from all eras of Star Wars, including elements from the previously expanded universe that had been created prior to Disney's purchase of the franchise in 2012. The series is meant to color in the missing tiles, fill in gaps, and help expand the lore of the titular character and the culture he hails from. To do so, he collaborated a lot with Filoni and George Lucas in helping shape the series and its story. Practicality was also a point of emphasis during the panel. Favreau and Filoni spoke specifically how they, and the good folks at Industrial Light and Magic went about creating a physical model for the Mandalorian's personal ship, the Razorcrest.